Here is the code for Dual Port RAM in Verilog & VHDL. This is designed as Dual port write only-read only type. 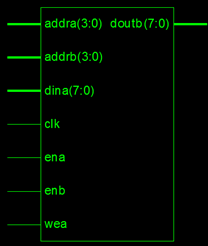 The PortA is used for writing data alone to RAM while PortB is used for reading only. This will be helpful for image processing applications, where the Control Unit will provide data for Processing Unit.